Home > Share Fundamentals > FIIs invested Rs. 2.5 lakh crores in India from 2008 till date..! FIIs invested Rs. 2.5 lakh crores in India from 2008 till date..! FIIs invested about 2.5 lakh crores in India from 2008 till date..! 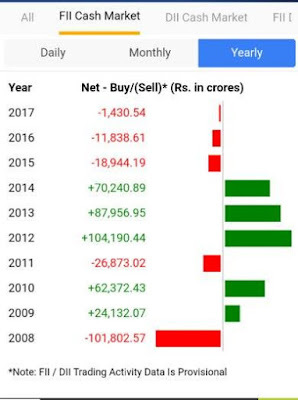 FII investments in India from 2008 till date. Can they run away just like that? Think all those who project Nifty below 5000? FIIs invested nearly Rs. 2.5 lakh crores.